The eighth Arab Woman Awards saw a special tribute paid to the late Ameera BinKaram, former vice-chairperson of NAMA Women Advancement Establishment and chairperson of the award jury for the last four years. Her legacy was acknowledged with a lifetime achievement award. The ceremony also honoured 22 inspiring Arab women in recognition of their outstanding contributions and exceptional achievements across fields including business, the arts, philanthropy and fashion. 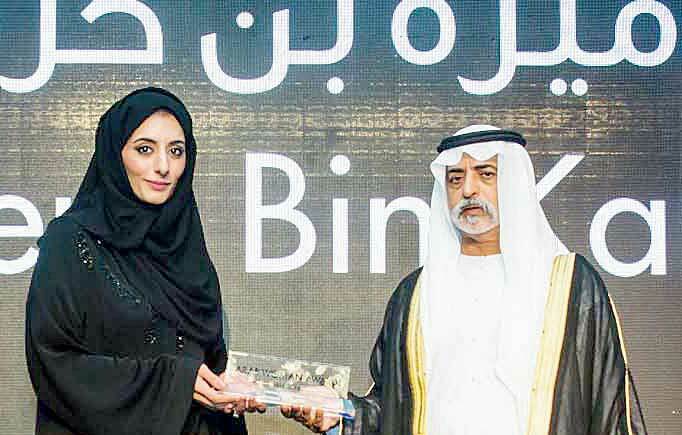 The special event was held in Sharjah, taking place outside Dubai for the first time in tribute to the late BinKaram, who tragically lost her life in a villa fire on October 2 this year. Her sister Reem BinKaram collected the award on her behalf. The event was attended by more than 400 dignitaries and high-level businesswomen. Keynote speakers praised BinKaram’s achievements, out-lining how she dedicated her life to enabling women through her tireless voluntary and humanitarian efforts. “Today, we celebrate the multitude of Arab women’s achievements and their vital role in deve-loping our Arab societies. We honour the accomplishments of the late Ameera BinKaram; may the Almighty rest her soul in peace, and pay tribute to the eff-orts she spent for the good of her country and the Arab world. It was her ambition and vision that made these efforts a solid ground for women’s development and progression in various fields,” said Shaikh Nahyan bin Mubarak Al Nahyan, Minister of Culture and Knowledge Development. “The fact that this programme is held annually in the UAE shows that our country encourages ?women’s excellence and values their important contributions to society. We should all be proud of Shaikha Fatima bint Mubarak, Chairwoman of the General Women’s Union, Supreme Chairwoman of the Family Development Foundation and President of the Supreme Council for Motherhood and Childhood, for her generous support for all women causes and for setting new standards in societal and human development,” added Nahyan. Sue Holt, executive-director of the award, said: “I’d like to mention someone very special and the reason we have bought the awards to Sharjah for the first time – Ameera BinKaram. I first met Ameera when she won the Humanitarian of the Year award in 2012 for her work with Friends of Cancer Patients. I was instantly taken with her enthusiasm, elegance and her passion for supporting others. She loved the ethos of the awards and was determined to help.